Pre-Owned vehicle pricing includes all offers. Tax, Title and Tags not included in vehicle prices shown and must be paid by the purchaser. While great effort is made to ensure the accuracy of the information on this site, errors do occur so please verify information with a customer service rep. This is easily done by calling us at 949-273-4077 or by visiting us at the dealership. 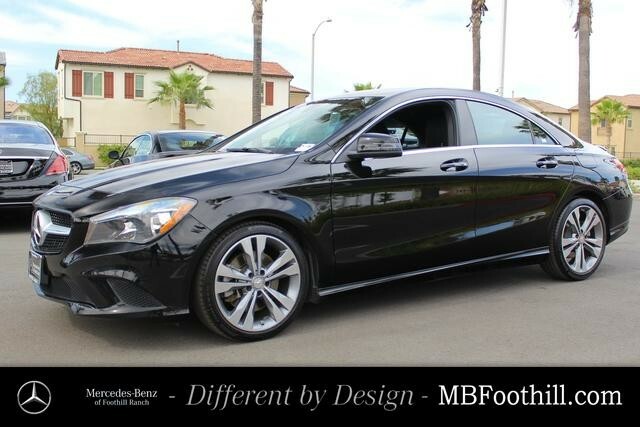 Mercedes-Benz of Foothill Ranch is offering this Certified 2016 CLA 250C at a very competitive price! We welcome you into our world-class dealership to test drive the vehicle of your dreams and experience the very best in selection and service. Original MSRP priced at $37,410! The world is your playground when you're behind the wheel of our Night Black 2016 Mercedes-Benz CLA 250 4 Door Coupe! Powered by an innovative TurboCharged 2.0 Liter 4 Cylinder that offers 208hp while perfectly paired with a race-derived 7 Speed Dual Clutch Automatic transmission. Enjoy pulse-pounding acceleration, brilliant handling of this Front Wheel Drive, and score near 38mpg on the open road! The aerodynamic stance of our CLA 250 looks sensational with its diamond-block grille, sweeping tail lamps, and unique alloy wheels. Find peace of mind in knowing that our Mercedes-Benz factory trained technicians to perform a thorough 164 point inspection to ensure that this vehicle has met our CPO program standards. Mercedes-Benz of Foothill Ranch as replaced any issue that is worn beyond the limits of our CPO program standards before certifying this vehicle and placing it for sale on the market.